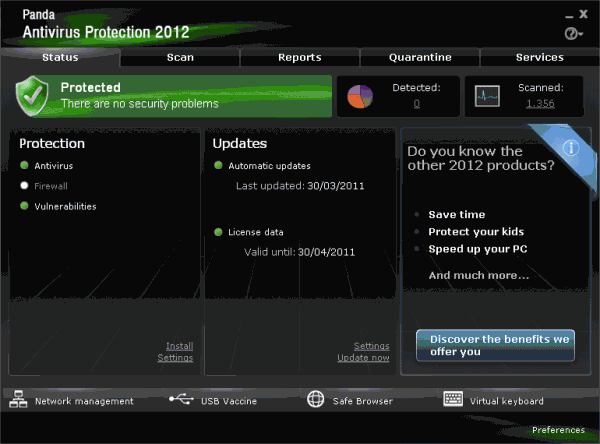 Panda Security has upgrade its anti-virus offering, Panda Antivirus Pro to version 2012. Panda Antivirus Pro 2012 improves on its already reliable security protection for PC computer against malicious viruses, spyware, rootkits, online frauds, identity theft, and hackers, by improving its real-time detection algorithm, collective intelligence from Panda user community, firewall, cloud virus detection database, USB Vaccine and other features. Protection against all types of known or unknown viruses and threats. Virtual Keyboard to enter password in a safe way. Live up-to-the-minute updates through combined Collective Intelligence and traditional signature updates. Personal firewall with WiFi security that blocks intruders and hackers. Panda USB Vaccine protects your PC and USB drive from infection. Home Network Manager to check the security status of your home computers. Panda SafeCD to clean all types of malware from your computer if you cannot start Windows. SOS Virus – a rapid response service that lets you submit suspicious files directly to PandaLabs’ engineers. Provide technical assistance and support through by e-mail and web, 24 hours a day, 365 days a year. As part of offer for Microsoft users, Panda Security is having promotion of 20% discount off retail price for Panda Antivirus Pro 2012, in addition to extending a trial version of Panda Antivirus Pro 2012 which includes 3 months service for free, instead of usual 1 month. The offer also includes free Panda Internet Security 2012 with 3 months license. Windows users who want to enjoy free 3 months protection with Panda Antivirus Pro 2012 can directly download the free 3 months subscription setup installer of Panda Antivirus Pro 2012: MicrosoftpromoAP12.exe. Install the program and you’re good to go with free 3 months security protection. No activation code or license serial key required. Panda Anti-Virus Pro 2012 is compatible with Windows 7 (32-bits and 64-bits), Windows Vista (32-bits and 64-bits) and Windows XP (32-bits).